A versatile whole class behavior management tool. 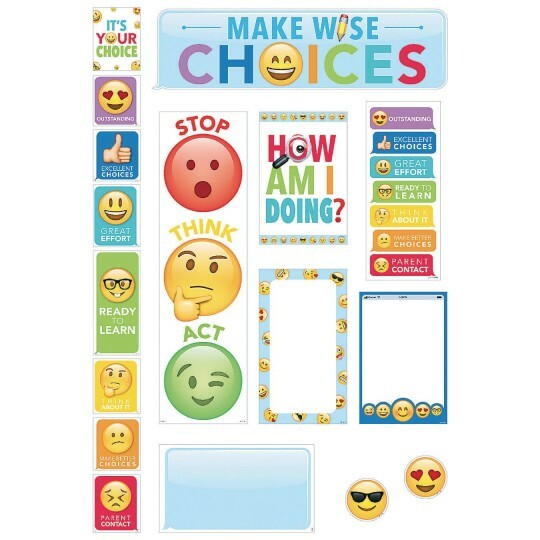 This Emoji Fun Behavior Clip Chart mini bulletin board is a versatile whole class behavior management tool that features easily identifiable emoji faces and icons. This chart will help students keep track of their behavior throughout the day and develop personal accountability for their choices. This colorful and unique 22-piece set contains 9 pre-printed behavior clip chart pieces, 1 customizable blank behavior clip chart piece, 2 blank labels, 6 desktop behavior clip charts, a “Make Wise Choices” header sign, a “Stop, Think, Act” sign, and 2 emoji face accents. Behavior chart includes a different color to indicate each level of behavior management. The emoji faces make this chart perfect for non-readers and non-English speaking students (ESL/ELL). The clip chart was ready to be laminated and put on the wall. Absolutely a wonderful addition to my sixth grade classroom!